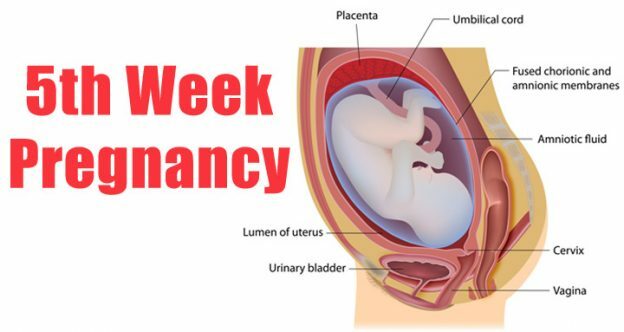 How big is your baby in the 5th week? 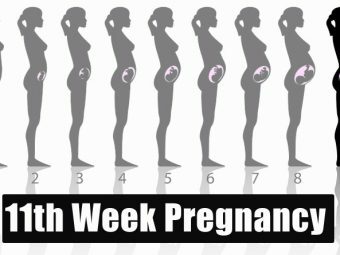 What symptoms do you experience in the 5th week of pregnancy? 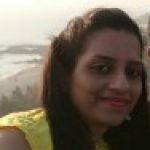 How to prepare for your first appointment? How Many Months Pregnant Are You At 5 Weeks? 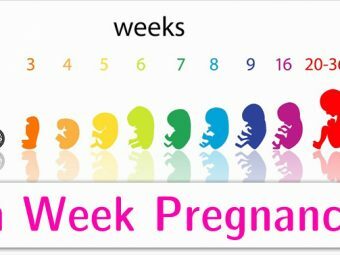 At five weeks, you are one month pregnant. A home pregnancy test this week will give you a positive test result. The baby is about the size of a peppercorn (1). Your baby measures 0.05in (0.13cm) to 0.1in (0.25 cm) in length, and weighs less than 0.035oz (less than 1g) (2). Fingers (3) Appear tiny and webbed. Face Has a reptilian appearance. Heart Starts to beat. It forms a tube-like structure. Ectoderm Develops to form the hollow tube called neural tube. Brain and spinal cord Neural tube develops into the brain and spinal cord. Blood vessels Developing; the blood flow has already begun. Limbs Arm and leg buds appear. Gastrointestinal tract (6) Begins to form. As you conceive, you will notice some changes happening inside your body. Next, let’s have a look at the early symptoms of pregnancy. By this time you must have confirmed the pregnancy at home. However, there are a few risks you should be wary of. Rupturing of the fallopian tube if pregnancy occurs in the fallopian tube and is associated with immense pain and heavy bleeding. If you experience only the early signs of pregnancy, then schedule a regular appointment with the doctor. Carry all the medical records that specify any medications and supplements you are on. Note down your LMP (last menstrual period) as it helps to calculate the estimated due date (EDD). If you have irregular periods, you may find it difficult to track the LMP. In such a case, the doctor will do an early scan to determine the gestational age. If tests or diagnostic procedures are recommended, find out why they are required. Moreover, if you have had any complications discuss that and also ask questions about any concerns you have. During your visit, the doctor will check your weight and blood pressure. The doctor may also recommend a flu shot (not a nasal mist) if you are pregnant during the flu season (10). Nevertheless, a flu shot can be given to pregnant women at any time during pregnancy. A blood test is done to determine the level of hCG hormone in the blood. 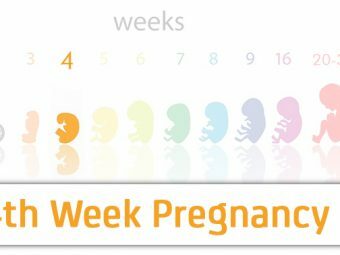 At five weeks of pregnancy, the hCG level in your blood is between 200 and 7,000U/L (11) and the progesterone level is 12 to 20ng/ml (12). If there is any significant drop in the hCG or progesterone level, it may indicate an ectopic pregnancy. This test also checks for the glucose level, red blood cell count, HIV, Syphilis, Hepatitis B, and the presence of antibodies against chickenpox and German measles (13). Pap smear test is advised if it is due in your case. This test is done to check for any infections like chlamydia and gonorrhea. A urine test is done to check for the level of sugar, protein, and signs of infection. 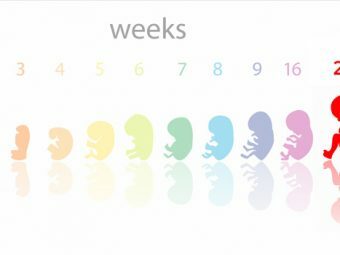 The first ultrasound is usually done in the sixth week as the gestational sac becomes viable this week. However, if you experience cramping, bleeding, or have a history of ectopic pregnancy, an ultrasound may be carried out to check for any complications (14). In the case of an ectopic pregnancy, the uterus will have a pseudo gestational, which is nothing but a build-up of fluids that mimics the true gestational sac (15). Also, an ultrasound will help determine twin pregnancy if two gestational sacs are visible. Additional care at home is also necessary to avoid the risks at this stage. Fix an appointment with the doctor. Eat foods that are a rich source of protein, vitamins, and minerals. Consume cereals, lean meat, fresh fruits and vegetables, and dairy products. Take prenatal vitamins like folic acid (400mcg/day) (16), which prevents neural birth defects such as spina bifida. To relieve morning sickness, eat smaller meals at regular intervals. Avoid smoking, drinking alcohol, and using illicit drugs. Nibble crackles that are rich in carbohydrates. Avoid deeply fried, fatty foods, salty and sugary foods. Spend time with family and friends for emotional and mental support. Wear supportive bras that can help relieve breast tenderness. At this vulnerable phase, you could use your partner’s support as well. Accompany you to the first prenatal visit. Create a pleasant environment at home. Plan a day out to celebrate your happiness. Discuss your plans for parenthood. 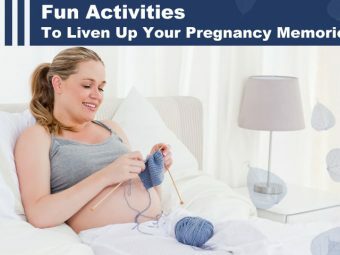 Help you around the house and keep worries at bay and make the journey of pregnancy a pleasant one. The news of pregnancy can be an exciting one but comes with a bunch of questions and the anxiety of stepping into parenthood. There may be uncomfortable symptoms in the early stage of pregnancy, but they won’t stay for long. Keep that in mind and think about the joy you will experience with the addition of a family member. The journey won’t be that bad after all.